This piece was once a quick daily sketch that I had done for the blog I started at PC with some students in the illustration department. The story behind it comes from Pink Floyd’s album, Dark Side of the Moon, and the theory that it syncs with the Wizard of Oz. I wanted to capture that idea in a single image without relying on sound or text, so I found that incorporating the album cover’s prism and rainbow would coincide perfectly with the scene where the film turns from black and white into color. I wanted there to be a distinct look between the two worlds, yet show that they can exist together, so the black and white part of the image is done with line-work and digital shading while Oz is created from colored shapes that make up Munchkin land. The title of this is again a combo of the album and the movie. 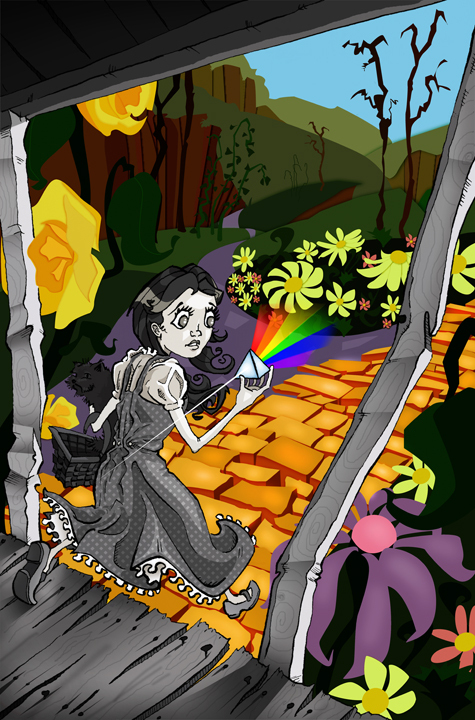 The scene that is referenced in my image is just before Dorothy sings “Somewhere Over the Rainbow,” which speaks to the transition to color and the rainbow coming from the prism in her hand.